To make use of a recovery USB drive, you must first boot the system from the drive you made. Insert the recovery USB drive into your PC and make sure it boots from it during the next restart. When loaded, the recovery drive first shows the keyboard layout option that you want to use. Find the language you want to use to type in the recovery environment, and click or tap the name. If your keyboard layout isn't displayed on this first screen, open "See more keyboard layout." For most people, the "US" layout works well, even if they are not English speakers. On the next screen select "Troubleshooting" to access all recovery options. You want to get rid of all your files and change the settings in Windows 10. This is recommended as a drastic way to start a new one. This can improve the performance of Windows 10 if you have accumulated a lot of system changes and your computer is slower. You want to give your computer to others, and you want to protect your privacy. When resetting, your personal data and settings are not available along with the PC. On the Troubleshooting screen, select "Recover from drive." "Just delete my file" - the personal file is deleted, and the Windows 10 settings are reset to default. However, your personal files can still be recovered using a data recovery tool. "Fully clean the drive" - ​​ensure that your data and settings are not available after you are finished. Data is completely deleted, and the general recovery tool cannot restore it again. This is the best option to choose when you want complete privacy. However, the process takes longer. Windows 10 runs a little preparation, and when it's ready, it gives you the final confirmation of the reset process. Click or tap "Restore" to start. 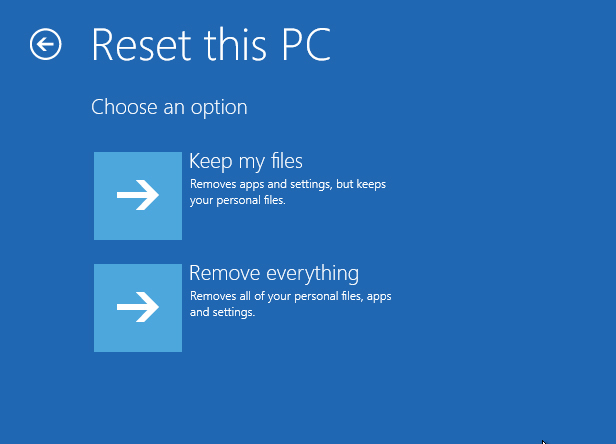 Windows 10 creates a restore point that allows you to roll back changes that make your system malfunction. It is a good idea to make restore points regularly and especially before upgrading the main hardware or software. When everything seems lost, system recovery can be a savior and allows you to return and recover from bad drivers, failed Windows 10 updates, or unpleasant applications. For more details, see What is System Restore and how to create a restore point in Windows. On the Troubleshooting screen, select "Advanced options." On the "Advanced options" screen, select the "System Restore" option. For the complete procedure of working with system recovery from a recovery drive, see Start System Restore when you cannot log in to Windows. The Windows 10 downgrade or, as Microsoft calls it, returns to the previous version, available from the "Advanced options" screen. Click or tap "Return to the previous version." The next screen prompts you to confirm the operating system you want to play back. In our case, we only installed Windows 10, so we chose it. On the next screen, you get a warning that you have lost applications and settings that have been installed or modified since your last update. Click or tap "Return to the previous version" to start the process.